Everyone has World Cup fever and Outside the Ball is getting into the spirit with Fabio Fognini and Robin Haase. From anger to celebration, host Mayleen Ramey and the ATP stars act out different emotions a fan can experience while watching an exciting game. 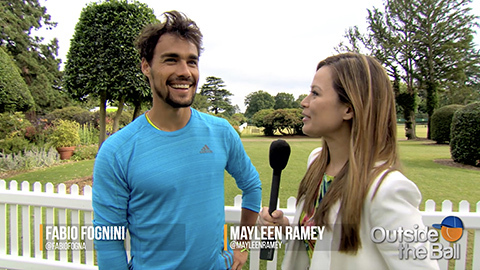 To start off the many faces of futbol, Mayleen sets the scene for Fabio Fognini. He was to imagine that the game was tied and his favorite team had a penalty kick. Fabio’s reaction was full of nervous anticipation. Robin Haase had his head in his hands with disgust at the thought of his favorite footballer getting thrown out of the game with a red card. In a moment that every fan dreams of, Robin and Fabio expressed their reaction to their team winning the World Cup. Robin leaped into the air with enthusiastic hollers while Fabio went in for a hug! We’ll be watching the FIFA World Cup and you can be sure that some of your favorite tennis stars will be cheering along.